The Christmas Season in New York City is Magical. All my life I have wanted to be in New York City at Christmas. 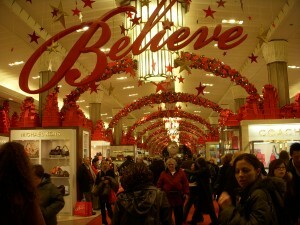 From the Macy’s Thanksgiving Parade through New Years, this whole city of Manhattan is Christmas. I took a friend and off we went, hoping for snow. Instead we had the biggest rain storm I have ever been in. The drops were as big as snow flakes. It should have snowed, it was cold enough. But, alas, we slogged through the water not wanting to miss a thing. Living in Seattle, Washington we don’t use subways, so it was a bit intimidating to be heading underground for transportation. 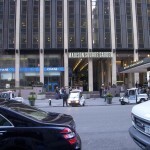 We stayed at the Courtyard by Marriott that was between 2 subway stations and around the corner from Madison Square Garden. All of these names I had heard all my life, and here I was in the middle of them. We took a Grayline Tour to see the whole of Manhattan. Upper Manhattan at night took us to Central Park and across the street from some of the priciest properties in the city. Celebrity’s apartments were pointed out as we rode along. People were kind enough to leave their drapes open and we could see the opulent chandeliers and beautiful décor as we sat on the top of the double decker bus. Because it was raining so hard and the windows covered with water, taking pictures wasn’t possible. There is a magnificently decorated tree in the middle of a circle. A daytime adventure was lower Manhattan where we caught the ferry over to the Statue of Liberty and Ellis Island. This gave me goose bumps to think that my fraternal grandparents from Denmark and maternal great grandparents from Ireland came through here. I wish I had more information about their lives when they arrived. Another night we strolled down 5th Avenue checking out the beautiful stores and windows all decorated. 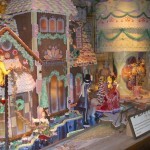 The stores such as Macy’s, Saks 5th Avenue, Lord & Taylor, and Tiffany’s were decorated inside and some had animations in the windows that were splendid. A walk to the tree and ice skating at Rockefeller City was a must see. But the cherry on top of the trip was tickets to see the Rockettes at Radio City Music Hall. We were many blocks from the theatre and quickly found out from about 4 PM to 7 PM taxis are impossible to get. So, off we went. The blocks in NYC are short one way and very long the other. We went the long way. This was a dream trip of my life and I would love to share it with you. You must go once in your life.